Just an example from the EU food and consumers goods market: I am living in the former „Eastern Block” in Hungary but travelling quite a lot across Europe. So I can have a quite clear overview about what is going on and available here and there. The market and the market powers are extremely unbalanced. While we see a boom here in the CEEU countries of Western EU origin goods and hyper-, super-, and discount-market chains, who are opening here hundreds of brand new shops, then meantime we see a very clear recession and shrinkage among the formerly prospering CEEU local food industrial producers. The Western EU producers and traders bringing here very wide variety of their goods and services in massive quantities while local food industries are struggling and restraining very much. Western side of Europe and the producer trading companies from there are ultra strong, developed and ultra competitive and they (business is business market law) do not respect at all that in CEEU producers are far not competitive enough and quick yet to take the glove and fight. People here needs working places and reasonable salary to buy these goods otherwise there will be soon no purchasing power. The Western EU companies untill now handled the CEEU countries just as a open market to penetrate and fill up and generate more consumption. But without local job, working places who will buy their goods? The system is a bit sick like this and might lead us into more problems than we had before. Another interesting example for the Single Market anomalies (let me be here a bit local patriot Hungarian, while I am real European): Recently I spent a few days in Italy in the beautiful Alto Adige, Trento (South Tirol) region and – As I love the exceptional good Italian food, which is may be one of the best in Europe.- visited a few local supermarkets as well. 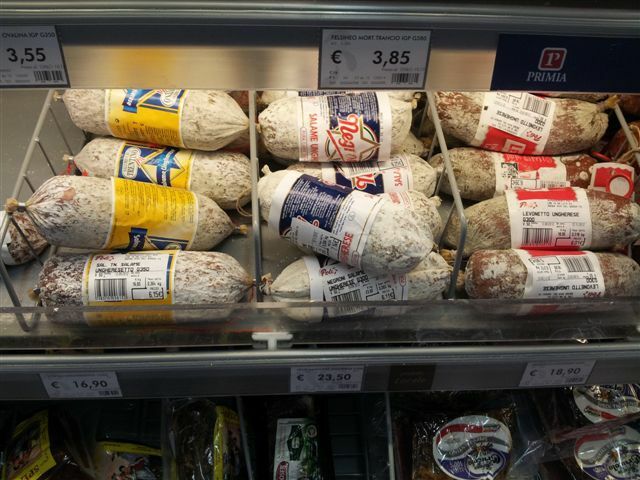 Not fully surprisingly but I found there that “Salami Ungherese” (Hungarian Salami) is a well known, very well going premium product category, which is very good, but unfortunately none of the several Salami Ungherese products there were made in Hungary but all of them had label stating made in Italy mainly in Trento, produced by local companies. Out of the tasty looks like and nice packing they are almost tasteless and far not the same as the real Hungarian Salamis (especially not like Pick, Hertz, Gyulai, Csabai traditional products) which are really “Hungaricums” (together with our famous Palinkas, Tokaji vine, Gulyas soup, Paprika spices, and so on…) and part of our national heritage same like Italians Parmiggano Reggano or their Proschutto Parmai Hams etc. Hungary is producing several excellent sparkling vines (Törlei, Hungária, BB etc.) but we do not call them “French Champagne (Made in Tokaj, Hungary)”. Anyhow, after tasting them realized that all of them are just very weak Italian made copies. Which is interesting in such a country where quality authenticity of food is one of the most important things. What could be the reason? 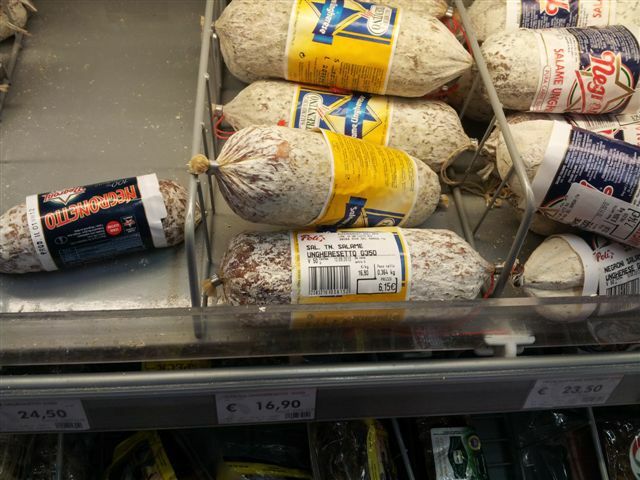 Why there are no any made in Hungary original Pick, Hertz salami products on the shelves? We are not so far from that market, Hungary makes quite extensive marketing and export of these products, the packing, appearance, quality of these Hungarian products are really first class, price wise it is not so expensive so these factors can not be the reason. The real reasons can be different and I am afraid these reasons are rooted in the unbalanced EU Single Market and in the differences of the market powers . 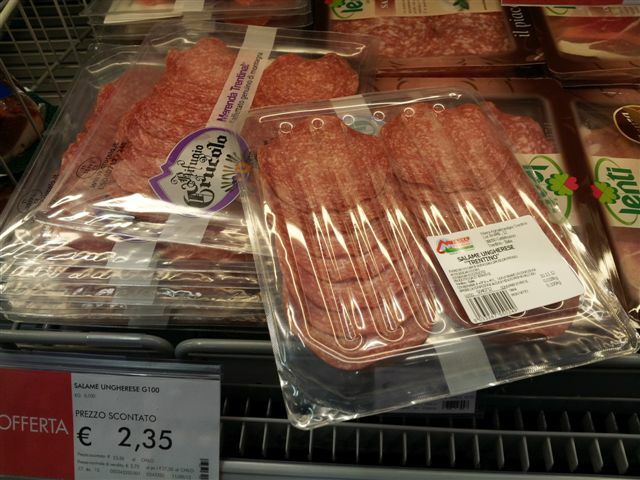 I am afraid Hungary does not receive real chance to penetrate to the Italian supermarkets chains because they built up such artificial and usually hidden barriers which are making impossible to bring there goods and appear on the shelves. (By the way, the same international companies are owning, running the hyper- and supermarkets there as here.) The Western European companies brings here their goods and pushing their sales massively while CEEU companies have not so much real chance to sell in Western Europe. Most probably these Western EU companies does not follow the unwritten but basic rules of use and let to use, enjoy and let to enjoy, live and let to live. In the field of industrial raw materials, semi finished products, auxiliaries the Single Market is working much better more smooth and market participants are using the advantages of it very smartly because of the long time ago discovered and understood interdependency between the industrial producers and the complex production chains. But these segment is usually going under the surface and on the surface we see only the trading and availability of the finished products which are dominated by the Western EU products. « EuroGames 2012 Budapest – Out Proud and Loud!